Our rugged mesh cover makes spring clean-up a breeze. The secret to this unique cover is the tightly woven scrim that holds together insuring that no gaps or holes develop. Resistant to chlorine and other chemical stains. Model: PRO1836DLX. Protech 18' x 36' Round In-Ground Pool Solar Blanket - 10-MIL durable above-ground swimming pool solar blankets can warm your pool this year by up to 15 degrees. Our solar blankets are made to give you maximum heating properties combined with long life.Features. Our Silver cover has all the strength and durability to ensure years of winter protection. Heavier woven polyethylene scrim and coating makes our Silver grade cover strong and able to withstand wind, sleet and snow. Arctic Armour Gold is constructed of our strongest and most tear resistant material. This cover features rugged U.V. stabilized woven polyethylene that protects it from sun, snow, wind and ice. It features a black underside to retard algae growth and heat sealed seams to ensure a crystal clear pool next spring. We believe that variety is the spice of life. Pool Supplies. Boat and Tube Accessories. Children's Stuff. We use these photos to validate the claim as well as for training purposes. We want to hear from you! Our Bronze cover has the strength and durability of covers costing twice as much. Arctic Armor winter covers are U.V. protected so they will last for years in direct sunlight. This cover is navy blue with a black underside. Since our scrim is so tightly woven, the cover allows almost no sunlight through and ensures an algae-free pool in the spring. Rugged double stitched hems are triple reinforced for strength and the cover's black underside retards algae growth. A Leafstop pool cover is one of the most important parts of any above ground pool. With a Leafstop pool cover you will find keeping leaves and debris out of your pool effortless! 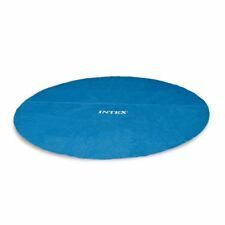 Leafstop Pool Cover for 15 x 9 foot or 5.5 x 2.7m aboveground RECTANGULAR POOL, Suitable for INTEX, BESTWAY SPLASHER pools. MADE BY SWIMLINE. Our entry level cover has the strength and durability of swimming pool covers costing twice as much. Our covers are U.V. protected so they will last for years in direct sunlight. We do not skimp on fabric! This unique Leaf Net Cover is made from a new, exceptionally durable, woven material that's so lightweight you can easily carry even our largest net under one arm. It prevents leaves and twigs from contaminating your pool water and eliminates that swamp-like build up that makes spring cleaning such a chore. Trending at C $44.08eBay determines this price through a machine-learned model of the product's sale prices within the last 90 days. The Super Deluxe Winter Cover is a heavy duty cover made to last for years. This above ground pool cover is made with extra strong laminated polyethylene material with thick, high-density polyethylene stitching. Up for sale is a New 18 Foot Round Winter Above Ground Swimming Pool Cover Durable High Density Thick K1. MADE BY SWIMLINE. We do not skimp on fabric! Our above-ground swimming pool covers use an extra foot of material—another reason why they are a great value! overlap provides a better fit, esp. on swimming pools with extra wide top-rails. A Leafstop pool cover is one of the most important parts of any above ground pool. With a Leafstop pool cover you will find keeping leaves and debris out of your pool effortless! With the Leafstop Pool cover you could stop up to 95% of evaporation! GLI Aquacover Estate Actual Cover Size 15-Feet by 21-Feet Oval Solid Winter Cover System for Above Ground Pools. This Aquacover solid winter cover will protect your pool from the wear and tear of freezing winter weather and eliminate costly maintenance and spring cleanup. We believe that variety is the spice of life. Pool Supplies. Boat and Tube Accessories. 18' Deluxe Pool Cover. We use these photos to validate the claim as well as for training purposes. We want to hear from you! We believe that variety is the spice of life. 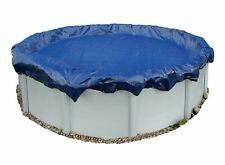 •Fits 16' (4.88m) round above ground Pools. Boat and Tube Accessories. Children's Stuff. We use these photos to validate the claim as well as for training purposes. Trending at C $51.03eBay determines this price through a machine-learned model of the product's sale prices within the last 90 days. GLI Aquacover Estate Actual Cover Size 21-Feet Round Solid Winter Cover System for Above Ground Pools. This Aquacover solid winter cover will protect your pool from the wear and tear of freezing winter weather and eliminate costly maintenance and spring cleanup. Bestway 19' Ground Cloth •19' x 19' (5.79m x 5.79m) ground cloth. We believe that variety is the spice of life. Float Tubes. •For use with 18' above ground pools. Children's Stuff. We use these photos to validate the claim as well as for training purposes. All of our blankets are U.V.-protected so they last under the most intense sunlight. Built to last and backed by a 5-Year Warranty. We believe that variety is the spice of life. Float Tubes. Pool Supplies. Boat and Tube Accessories. We use these photos to validate the claim as well as for training purposes. We want to hear from you! 4' Overlap. The deluxe series cover is blue on one side and black on the other. This cover has an 10 Year Limited Warranty. Only used a few times. Looks and functions like new except for some dirt. Intex Krystal Clear 18-Foot Solar Pool Cover. You may already have an account. Solar-heat-retaining cover for 18-foot round pools. Decreases evaporation by 95%; maintains heat. Easy to keep.